Say you are building solutions for better mobility in cities. You are developing an app or platform for sharing transport opportunities: car pooling, bike sharing, sharing taxi rides, you name it. You are doing two week development sprints, getting continuous feedback from your product owner. You’re watching your WIP limits, making sure work flows optimally. You are also continuously incorporating usability feedback. People say they like your app, say they find it a breeze to use. So it seems you’ve got everything in place to create a great app. Your development process is highly optimised, very lean, no waste. But is it delivering the right solution? Or are you iterating towards failure? Now take a step back from your solution. What is the goal you’re trying to achieve? Decrease car traffic? Increase cycling and walking? Fewer parking problems? More relaxed shopping? The increasing focus on an iterative way of working is a good thing. It helps us keep focus, identify bottlenecks quickly, actively engage stakeholders in our organisations as well as end users. But it’s only when rigorously applying these techniques and mindset at business level, that we can expect to produce something valuable. Are people able and willing to use your app? Will enough people use it to such an extent that you can achieve your goals? Agile software development alone will not answer these questions for you. Agile software development enables you to iteratively throw away a lot of money. Strategy: Get crystal clear on the goals you are trying to achieve. Without goals, there’s no way telling whether your project is successful or not. Without goals, there’s nothing guiding your development efforts. 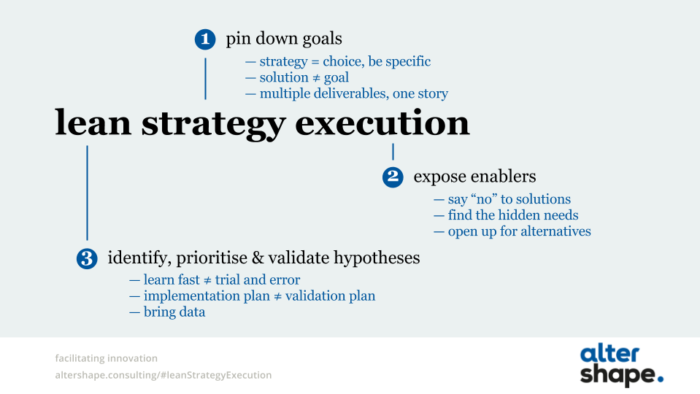 Execution: Strategy brings guidance, but execution brings results. What are the key success factors that will help you achieve these goals? How do different possible solutions compare? Lean: A project implementation plan is just the start. Continuously identifying, prioritising and validating hypotheses enables you to adjust your plan to the reality of the world outside of your organisation, to the behaviour of your actual customer. Finally, benefit mapping is a great technique to bring everything together on one page and serve as a visual guide to your lean strategy execution approach. Join my upcoming IT Works seminar to get hands-on and make the shift to lean strategy execution.